Frozen blueberries are the best meal prep hack I have discovered! While I freeze strawberries, raspberries, and blueberries; of all the berries, blueberries freeze most beautifully and easily. They don’t get mushy and last for months. Last week we had 12 guests in the home and you know what makes a quick, healthy, and delicious breakfast for a big lot? Berry Smoothies! Frozen berries make it even easier as you don’t need to add any ice and you also don’t need to defrost them for smoothies. In general, blueberries seem to disappear pretty quickly in my house. Just yesterday I bought a whole box and when I went looking for them to add in my jar of overnight oats, they were all gone! Luckily I had frozen a big batch just last week, and I just dunked into my frozen blueberries bag and added some. 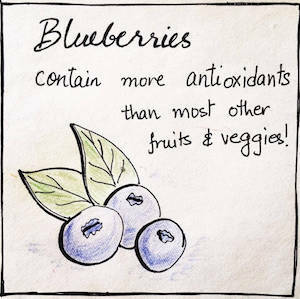 Did you know, blueberries are amongst the richest sources of antioxidants amongst all fruits? They are small, but packed with vitamin K, C, manganese and lots of fiber. They are called the super, super foods. They help with alertness, memory, heart health, eyesight and control diabetes. Do you feel the season of blueberries doesn’t last long enough for you to enjoy them fully? I feel they come and go too quickly before I’ve had time to make everything that I want to make with them. I love snacking on them as is and add them to smoothies, overnight oats, and morning cereal bowls. Most of my regular baking recipes get a blueberry twist when they are season… the pancakes become blueberry pancakes; the banana muffins become blueberry-banana muffins, the chocolate cookies become blueberry and chocolate cookies and so on :-). Fresh blueberries will stay good in the refrigerator for a week to 10 days. Fresh blueberries in the Northern Hemisphere usually come between May to August and while you can get imported berries from South America after that, I prefer freezing fresh local berries than buying high priced imported blueberries with a huge carbon footprint! Freezing berries is my answer to the short blueberry season. When frozen properly, blueberries will last for 10-12 months, in time for fresh berries again :-). Freezing blueberries at home is super simple and there is absolutely no reason why you should not do it and prevent yourself from indulging in these beautiful (and did I day super healthy) blue beauties. 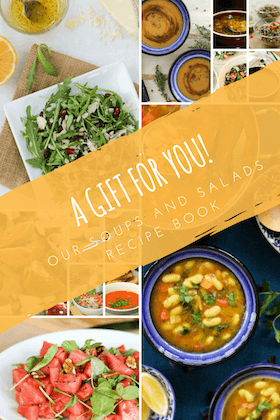 If you find this easy how-to recipe helpful, please take a moment to rate it and/or leave your comments at the end of the blog. It will really encourage me to keep exploring, learning and improving. 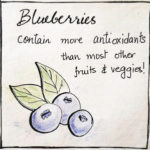 Frozen blueberries are a great addition to your breakfast bowls, smoothies, ice-creams, and baking. Of all berries, blueberries freeze most beautifully and easily. 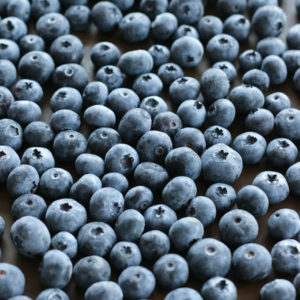 Buy fresh blueberries at the peak of season, wash, dry, and pop in the freezer. They don’t even really need to thaw, just feast on them as is! Place them in a single layer on a baking tray and let air dry. Remove any stem and green or squashed berries. Transfer them into a freezer bag and return to the freezer. Blueberries freeze individually so you can just remove as much as you need each time. *I prefer to wash blueberries before freezing so that they are ready to go into a recipe when I need them to. But you can also freeze them as is without rinsing and rinse just before use. 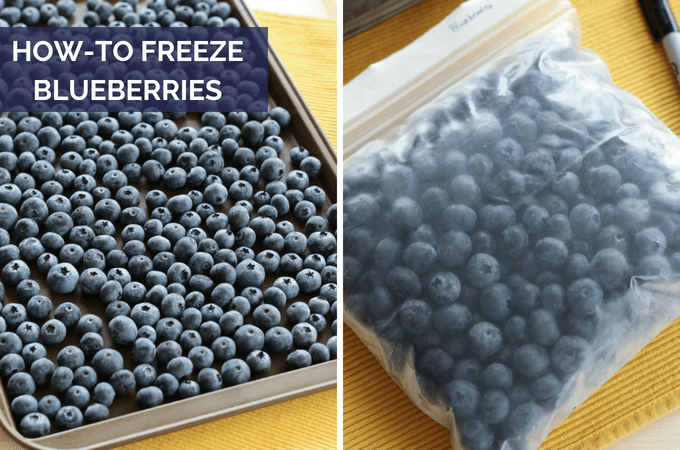 **Freezing in tray first helps freeze blueberries without getting mushy or squashing the berries at the bottom of the bag. But don’t keep them in the baking tray for long as it might result in freezer burns. If you are short on time, directly freeze in a freezer bag. When properly stored, frozen berries will stay good for 10-12 months but for best results, use the frozen berries within 8-10 months. Nutritional info is for 100g blueberries. How to thaw frozen blueberries? Just place them in a bowl and cover with water. Blueberries will thaw in just about 5 minutes. However, frozen Blueberries don’t really need to be thawed for most recipes. Just toss them directly into smoothies, shakes, pancake or muffin mixes, or your cereal bowl. I also like to eat frozen berries just like that… cold and refreshing, they taste like little blueberry sorbets!